Hey everyone, my name is Kayla. I’ve been waiting for my short bio to be up on the “Who’s who” page so I could write my first post and not be a complete stranger, and when I saw it there today my heart nearly stopped working I was so excited. To introduce myself, I am currently a freshman (aka freshmeat, yeah I know…) at the high school I attend. I’ve loved science just about my whole life because it satisfies my never-ending need to know how everything works. I live in a diverse and multicultural family that lives in the diverse and multicultural city of Miami, Florida, and I have been exposed to many different viewpoints. When I was younger my friends would talk about going to church and praying, and I thought that maybe I was missing out on something. The first time I realized that religion might have it wrong is when I read a book on Darwin and evolution at the age of 12 and the first time I realized I wanted no part in a religion (of any kind) was at the same age when I learned what the Holocaust was. I don’t enjoy fighting much, so I avoid the topic of religion at all costs when talking to my friends. Teen Skepchick is a much welcomed outlet for my thoughts on these subjects. I look forward to posting as often as homework will let me. You have officially started blogging at the same age when I started blogging! Kudos! Since I can’t drive yet I used to keep my Darwin fish pin on my book bag, but then I got a fedora hat (which my mother absolutely abhors) and I stuck it on there so it is the Epic Darwin Fish Fedora Hat… of SCIENCE! Thanks for commenting guys, it makes me feel all welcome and snuggly inside. Sadly I don’t own a super awesome fedora hat or a car and have to put stickers on my binders for school and in my locker. Welcome welcome! Nice to have you here. OOOOH! Greetings, fellow freshman! At orchestra two weeks ago I saw an FSM fish sticker on someone’s cello case. Great for kicks and giggles. Would you like a cyber-hug to make you feel even more snuggly inside? Welcome Kayla! Looking forward to read your posts! I’m sorry, did I just read that you hate caramel?! You mean that gooey, chewy, dreamy, splendid, golden sugary stuff that you find around apples, Twix bars, and certain species of Hershey’s Kisses?! I have a couple of darwin fish, including one which says “RANDI” inside it. There’s also a T-rex eating the original christian fish. I haven’t put any of them on my car though, as they’re likely to attract vandalism. Sad state of affairs. Welcome Kayla! Looking forward to reading your stuff. Hope I’m as eloquent as you when I’m a freshman. Welcome Kayla! Some people in my neighborhood hat Flying Spaghetti Monster lights up last December. That was really fun to see. I couldn’t imagine what their neighbors thought. Hi Kayla! I have a FSM fish on my car, and my boyfriend does too. I’ve never had any vandalism problems – maybe people are too confused by it to care. An FSM fish might not attract as much negative attention or vandalism as a Darwin fish because most people will take it as a joke. 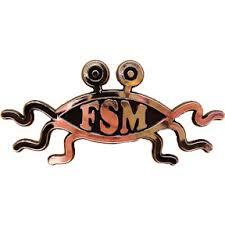 At least, that’s what I’ve noticed when kids around my school mention the FSM or Pastafarianism. But if they didn’t know what the FSM was, I would say they might be more than a little confused, yeah. I don’t do too much in the way of stickers and such… but I do sport a skepchick bag!